Ever use a headset with Skype, and were frustrated that it was too quiet? Skype Sidetone fixes that. The problem is inadequate side tones -- there is not enough feedback from the microphone into your headset to allow you to modulate your voice appropriately. 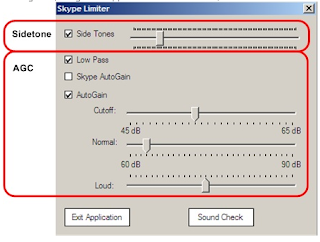 The Skype Sidetone application was designed to be a small tool that adds the sound of your own voice to your headset, so you don't exhaust yourself shouting to be heard.